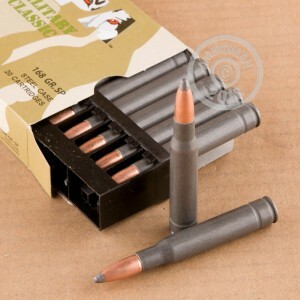 An inexpensive load that can be used for both hunting and target shooting, this .30-06 Springfield ammunition from Wolf achieves impressive cost savings through the use of non-reloadable steel cases. Each round in this case of 500 fires a 168 grain soft point bullet at a muzzle velocity of 2,575 feet per second. The relatively high weight of the bullet results in good penetration and strong terminal performance against deer and other midsize game. 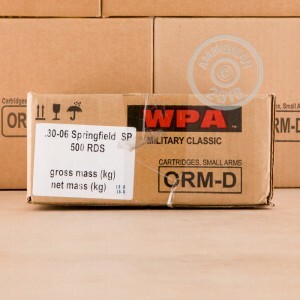 This ammo is made in Russia using non-corrosive Berdan primers; grab this case or any other items totaling $99 or more at AmmoMan.com to get free shipping!